Save up to 62%, why not try? Enjoy a long-lasting solution to persistently dry eyes with Blink Intensive Tears Plus liquid gel eye drops from AMO. They are available in a handy travel-sized 10ml bottle to carry with you wherever you go, suitable for both day time and night time use. 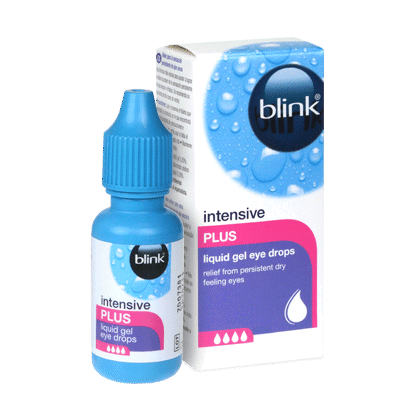 Blink Intensive Tears Plus eye drops contain a soothing demulcent and viscosity enhancer (Sodium Hyaluronate) to help tackle the effects of irritated, gritty and tired eyes. These highly effective drops are proven to provide even longer lasting relief from dry feeling eyes. For many of us, we constantly find ourselves sat in front of computer screens or our smartphones for long periods of the day. The eye drops work to lubricate the eye’s surface and maintain clear vision. For use, please remove your contact lenses before you apply the Blink Intensive Tears Plus liquid gel eye drops and reinsert them once your eyes are clear of any temporary blurring of vision. At Feel Good Contacts, we offer an extensive range of Blink products to suit your eye care needs.